With the certification of candidates for the upcoming (May 17, 2013) Chicago Teachers Union election completed as of the April 10 meeting of the union's House of Delegates, CORE, the Caucus Of Rank and file Educators, launched its 2013 re-election campaign with a morning and early afternoon rally and party on Sunday, April 14, at the Haymarket in Chicago. The event heard speeches from the CORE leadership, including the four candidates for elected union office, and organized for the upcoming election. 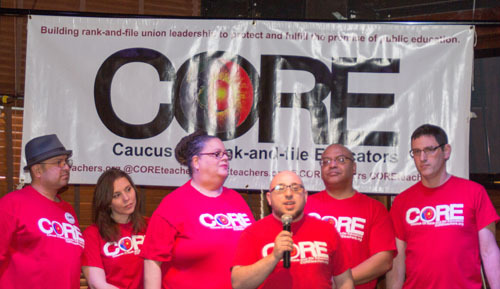 The leaders and leading candidates of CORE took the stage at the Haymarket in Chicago on April 14, 2013. Left to right, Al Ramirez (caucus so-chair), Kristine Mayle (CTU financial secretary and candidate for re-election), Karen Lewis (CTU president and candidate for re-election), CORE co-chair Nate Goldbaum, Michael Brunson (CTU recording secretary and candidate for re-election), and Jesse Sharky (CTU vice president and candidate for re-election). Substance photo by Howard Heath.After the event began with the singing of the union song "Solidarity Forever," led as be CORE tradition by Michelle Gunderson, the candidates for re-election as CTU officers were introduced by the co-chairmen of CORE, Al Ramirez and Nate Goldbaum. Michael Brunson told the group about many of the issues facing the union and the need to re-elect the leadership that had brought the union's members to the first strike in a quarter century and a contract that provides more powers at the local school level than every before. Kristine Mayle, recording secretary, reminded the group that the struggle against the school closings was still a priority, telling everyone how she first worked with CORE as a result of the move by the Board of Education to close De La Cruz Middle School, where she was working at the time. Vice President Jesse Sharkey provided some historical detail on recent union elections. "No candidate that brought a contract to the membership has been re-elected since 1998," Sharkey said. Tom Reece (and the United Progressive Caucus, UPC) brought in the 1998 contract at the behest of Mayor Richard M. Daley, and was defeated by Deborah Lynch (and the ProActve Chicago Teachers, PACT caucus) in the May 2001 election. After the contract that Lynch negotiated in 2003 disappointed the membership, Lynch was defeated by Marilyn Stewart and what was then calling itself the "New UPC" in the 2004 election. Stewart did not have to negotiate a contract during her first term, and so her contract wasn't finalized until after the 2007 union election, when she was re-elected. But in the 2010 election, Stewart and her "New UPC" were ousted by CORE. Now, in 2013, the CORE incumbents are facing a coalition composed of the two former adversaries, Deborah Lynch's PACT people and the remnants of the UPC (Marilyn Stewart is retired and not active). The new group, calling itself the "Coalition To Save Our Union" is headed by two former UPC stalwarts (Tonya Saunders Wolffe and Mark Ochoa) and two people from PACT (Mary Ellen Sanchez and Kelly McFarlene). Sharkey reminded those at the Haymarket that they will have to work very hard between now and election day to ensure that the history doesn't again repeat itself. Karen Lewis's speech was an outline of all the challenges still facing the union in the aftermath of the first strike in a quarter century and the complex contract that she and her team negotiated with the help of an unprecedented "Big Bargaining Team" consisting of members from every major group in the union. The crowd, which continued growing until early afternoon, not only enjoyed the event, but also continued planning for the election campaign. At the end of the event, Al Ramirez reported that more than $1,000 had just been raised for the election campaign. 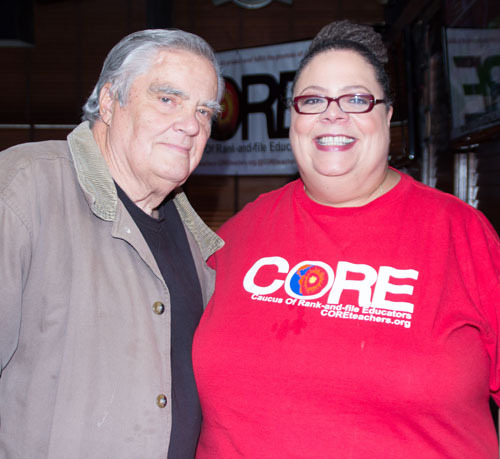 One of the leading organizers for CORE in the 2013 election, and a candidate for Area Vice President, is southeast sider Sue Garza, whose father joined Karen Lewis at the April 14 event. Ed Sadlowski was a leader of the Steelworkers Union for most of his life before retiring. Substance photo by Howard Heath.Each of the four candidates for union officers gave a brief speech, people talked and planned at length, and the election campaign now goes into the schools for a Chicago-style election campaign which will last for the next four weeks. The voting will take place in all schools on Friday, May 17. Several present noted an irony in the manner in which the election has so far been covered by Chicago's corporate media. On February 20, 2013, the Chicago Tribune, the Chicago Sun-Times, and Catalyst all covered the announcement that the new opposition group -- the "Coalition to Save Our Union" -- were going to try to run. That day, the Tribune and Sun-Times featured photographs of the four candidates for union office from the "Coalition to Save Our Union" -- striding down the Merchandise Part hallway towards the union offices. Catalyst provided equally extensive coverage. All Chicago media were informed of the April 14, 2013 CORE event, and were told that not only could their reporters interview Karen Lewis and the four officer candidates, but that dozens of rank-and-file members of CORE -- all classroom teachers or school-based PSRPs -- would be available to talk about the issues. More than 50 of those at the Haymarket on April 14 were candidates for the Chicago Teachers Union executive Board or candidates running on the CORE slate for the convention delegations to the national convention of the American Federation of Teachers (AFT) in July 2014 and the convention of the Illinois Federation of Teachers (IFT) next year. [Disclosure: This reporter is a member of the CORE steering committee and a candidate for AFT/IFT convention delegate]. The selection of the Haymarket for the event was conscious, the leadership making sure that CORE activists and candidates understood the place that their militant union and union leadership have in Chicago and labor history. During and after the event, several people walks across the Kennedy Expressway to the site of the so-called "Haymarket Massacre", where striking workers and police confronted one another on May 4, 1886 and where a bomb exploded, killing seven police officers and four others. Although there was no evidence that any of the organizers of the rally at the Haymarket (which had been organized in support of striking workers at the McCormick Reaper plant on the city's southwest side, the organizers were indicated and convicted to conspiracy, a common charge against union leaders by the plutocracy, both then and since. The resulting legal lynching of labor organizers helped prompt the launching of May 1 as the annual "International Workers Day" around the world. 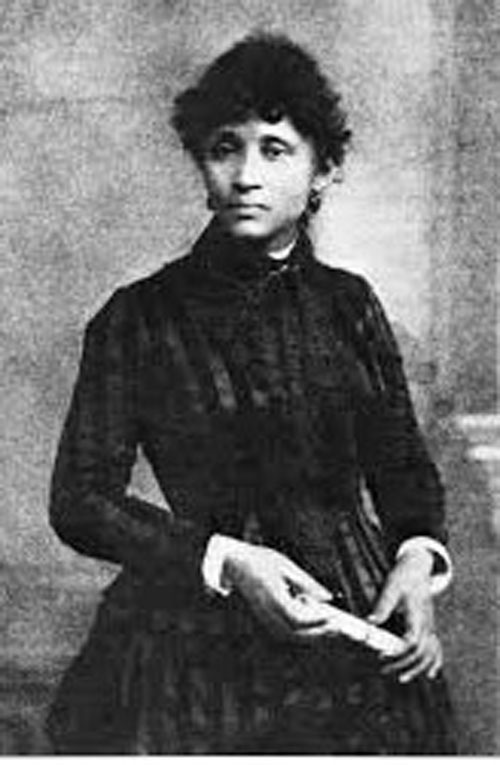 One of the widows (Lucy Parsons) remained a leader in the socialist, communist and labor movements until her death in Chicago during World War II. "Lucy (or Lucia) Eldine Gonzalez was born around 1853 in Texas, probably as a slave, to parents of Native American, African American and Mexican ancestry." Wikipedia reports. "In 1871 she married Albert Parsons, a former Confederate soldier. They were forced to flee north from Texas due to intolerant reactions to their interracial marriage. They settled in Chicago, Illinois. "Described by the Chicago Police Department as "more dangerous than a thousand rioters" in the 1920s, Parsons and her husband had become highly effective anarchist organizers primarily involved in the labor movement in the late 19th century, but also participating in revolutionary activism on behalf of political prisoners, people of color, the homeless and women. She began writing for The Socialist and The Alarm, the journal of the International Working People's Association (IWPA) that she and Parsons, among others, founded in 1883. In 1886 her husband, who had been heavily involved in campaigning for the eight-hour day, was arrested, tried and executed on November 11, 1887, by the state of Illinois on charges that he had conspired in the Haymarket Riot — an event which was widely regarded as a political frame-up and which marked the beginning of May Day labor rallies in protest..."